Managing your business servers must be a top priority. They serve as databases for all your sensitive data, information and business transactions. However, not all companies can handle complicated IT tasks all by themselves. In these instances, what they do is rely on server management to a managed service provider (MSP). Outsourcing server management service allows you to cut back on your operating expenditures. Managing your servers is an expensive endeavor. But when you outsource these services, you will have an opportunity to save money. This gives you more resources to invest in the development and growth of your business. When you outsource server management services, you will guarantee around-the-clock IT support. Your provider will ensure the delivery of top-notch IT services throughout the day. This means that technical specialists are always watching over your servers. Your provider ensures this through having an IT management team that works in a shifting basis. Guaranteeing 24/7 server management services is important. It allows your servers to remain healthy and run smoothly throughout the day. Through continuous server monitoring and support, you can ensure that all technical issues can be resolved in real-time. Your provider can act quick and troubleshoot issues before they get worse. This way, you can prevent prolonged network downtime and other worse IT crises from affecting your servers. What’s great about outsourcing server management services is that you can get access to modern and flexible solutions. A greater thing about this is that MSPs allow you to use these technologies without heavily investing in them. Managing your own business servers will require you to invest in new IT systems management and monitoring tools. These tools are costly. You also need to spend on additional costs for equipment maintenance. Adding to these are the licensing costs for the IT solutions that you will use. 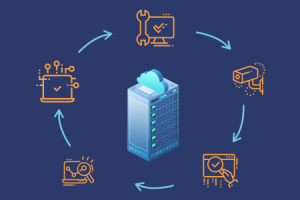 However, when you outsource server management services, your provider will be the one in charge of giving you access to the best server management tools available. Your provider will ensure that these tools are meeting stringent IT security standards. It will also be the one in charge of upgrading these tools. This allows these technologies to keep up with your growing business demands. Through these, you ensure that your servers can maintain optimal stability. Outsourcing server management services give you access to an experienced IT team. MSPs main goal is to provide top-notch IT services. One way of guaranteeing this is to ensure that only qualified IT specialists and engineers are doing the job. Similar to server management tools, hiring your own IT team will also cost you huge expenses. But when you outsource server management services, your provider will be the one to give you access to a well-trained and experienced IT team. These IT professionals went through an intensive hiring process. This gives MSPs the opportunity to select the best people for the job. Moreover, these IT professionals also went through regular training courses. These trainings are designed to provide them with up-to-the-minute server management knowledge and skills. This guarantees the delivery of top-notch server management services to all clients. When you outsource server management services, you also guarantee the security of your servers. Business-grade servers are common targets for cybercriminals. This is due to the vast amount of sensitive data that are kept in it. However, implementing advanced security protocols is a complicated task. An MSP has enough IT resources that allow them to take over these tasks on your behalf. Your provider will assess every aspect of your IT infrastructure. This allows them to create advanced cybersecurity strategies. Your provider will administer security functions in a regular basis. These include patch management, vulnerability scanning, and firewall protection. On top of these, all servers and other endpoints will have an anti-virus tool installed in them. Through these IT security functions, your provider will be able to protect your servers from emerging cybersecurity threats. thinkIT Solutions is a reliable IT management firm based in New Orleans. For almost two decades, thinkIT Solutions has delivered only the highest quality of services to their clients. thinkIT Solutions houses an experienced team of IT professionals that helps you find strategic solutions for all your IT challenges. Want a reliable IT management firm to provide you with high-quality server management services? Call thinkIT Solutions today at +1 (504) 455-5552!